So I promised myself that wouldn’t happen this year and I was going to master the “what to wear to a baby shower or bridal shower” dilemma! I started by revisiting outfits I wore to past showers and I quickly realized that while despite my indecisiveness when getting dressed, I always end up in a relatively similar outfit. AND when Megan showed up wearing a similar look to mine at this shower it was pretty apparent that this look is not only my go-to baby shower and bridal shower outfit, but a lot of other people’s also! Go for a print! Not something too crazy, but a fun floral is always appropriate! Stick to a comfortable silhouette! 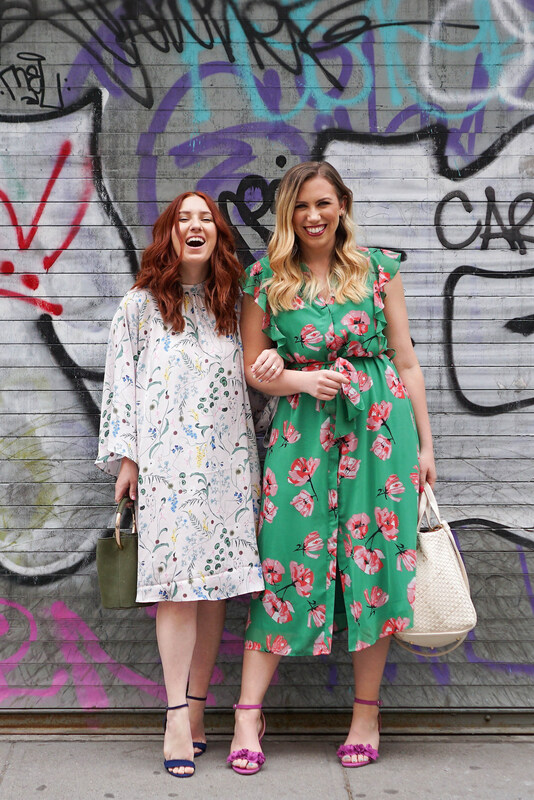 I opted for a lightweight midi dress and Megan went for a loose, breezy mini! You never know what you’re going to end up doing at a shower so it’s best to be comfortable…even if it’s just sitting, eating and watching presents being opened! Break out your heels! Since the chances are you’re going to be sitting majority of the time why not take those special heels out for a spin. I love the rosette sandals I’m wearing here. They’re so fun, compliment my dress and are perfect for walking and looking pretty! I’ve rounded up my favorite dresses that would be perfect for any baby shower or bridal shower on your calendar this season! I hope these tips will help getting dressed for your next shower a little bit easier!